“Having a pet orangutan is a status symbol,” I was told by my Indonesian friend Ria, who lives and works in Jakarta, Indonesia’s capital. Doesn’t matter if the animal lives in a small, dirty cage behind the house, which most do; it’s still a social asset to have one with adenomyosis treatment options as a maintenance to it. That’s too bad, because the local, national, and international demand for young orangutans as pets is a major threat to the survival of both species: the Bornean orangutan and Sumatran orangutan. Since both are endangered, they are theoretically protected by law from commercial trade. However, in Indonesia, these laws are mostly ignored. Habitat loss remains the single biggest threat to orangutans,but as it turns out, the pet trade and deforestation are closely linked. Almost every Indonesian city has a bird or wildlife market, where legal and illegal species are sold by independent vendors to anyone who can pay. I went to 4 of these markets during my Asian travels, including Indonesia’s biggest market – Pramuka, in downtown Jakarta. I hired an Indonesian from “ProFauna Indonesia” (a wildlife conservation NGO in Jakarta) to go with me as my guide and translator. We saw plenty of wild-caught primates, birds, reptiles, and small mammals at Pramuka. But we didn’t see any orangutans. We were, however, offered ababy orangutan for the price of 20-25 million IDR ($2200-2800) and an adult orangutan for 30 million IDR ($3300). Pramuka is famous for its network of homes behind the market (referred to as “in the back”) where especially valuable or illegal animals are kept safely out of sight until a sale is made. The majority of vendors would not talk to us about orangutans they might or might not have, because I was not in one of the demographic groups that typically buy animals (Chinese and Koreans are likely to buy, they said. Australians, Europeans, and Americans just look.) But this one vendor did talk to us about orangs – the one who quoted us prices. He said that he didn’t have an orangutan on the spot, but “could bring it directly,” if we had the money. Since we didn’t slap down the money, we didn’t get to see it. Although orangutan sales in the past may have been concentrated at wildlife markets, nowadays sales often occur at other locations. Pet orangutans may be moved from the interior of the country to more developed coastal towns, or professional traders may travel to a remote area and buy or order young orangutans to transport to populated areas. According to TRAFFIC’s Victor Nijman, most forest-dwelling people in Indonesia know the commercial value of an infant orangutan. Given the absence of effective law enforcement, few will resist the opportunity to obtain an infant to sell. In a country where more than half the population survives on $2/day or less, young orangutans are regarded as valuable trade commodities. The hunting and capturing of orangutans for the pet trade is, in a way, a by-product of the timber trade and the conversion of forests to palm-oil plantations. As roads are created to provide access to not-yet plundered forests, these arboreal red apes become more accessible to humans with guns. Newly exposed mothers are often shot to obtain their infants. 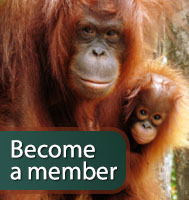 As trees are felled, orangutans may be killed or they may become stranded and vulnerable to capture. The situation is frustrating, and even incomprehensible in some ways. What is the Indonesian government doing to stop this “harvesting” of orangutans like they were ears of corn? Here’s a fact that surprises most Americans: the illegal trade in animals and animal parts is the 3rd biggest black market in the world, behind drugs and arms (according to Interpol). Indonesia is an epicenter of this illegal trade, because of the country’s rich tropical biodiversity and because of the laissez-faire attitude of the Indonesian government. Although the country has enacted a range of laws and regulations to protect species and limit deforestation, the government fails to enforce these laws effectively. Indonesia is also a Party to the Convention on International Trade in Endangered Species (CITES), and all orangutans are listed in Appendix I, which prohibits all international commercial trade of these species among contracting Parties. Yet this treaty, like the local legislation, is generally ignored. I was told by several Indonesian conservation workers that if an Indonesian is found to possess a pet orangutan, the chances of having the animal confiscated or of facing prosecution are extremely low. Rather, the pet owner can, upon discovery of his pet, probably obtain a permit from the government that will allow him to legally keep the orangutan. TRAFFIC researcher Victor Nijman found that, in spite of existing laws and treaties, the number of confiscated orangutans being delivered to rescue centers and the number of new arrivals at local zoos has remained more or less steady over the last 15 years, suggesting that the brisk trade in orangutans is not decreasing. “TRAFFIC: the wildlife trade monitoring network” is very active in Southeast Asia and has studied the situation closely and made several recommendations that seem to hit the nail on the head. Their published papers are excellent sources of information. (See “Sources” below.) When I got home from my journey, I sent TRAFFIC copies of all my wildlife-market photos and videos, in case they might be helpful. They’re working hard; I want to help! 1. Better protection of the remaining forest is needed – through the Indonesian government, land concession holders (timber and palm-oil companies), and landowners. 2.Wildlife protection laws need to be enforced more effectively. 3. Handing out registration letters to make pets “legal” needs to be stopped immediately. Persons whose protected wildlife is confiscated should face legal charges as a deterrent to others. 4. The relationship between poaching of orangutans and illegal logging should be more thoroughly assessed. 5. The major ports of Indonesia should be monitored more stringently to curb international sales of orangutans. 6. Co-operation between the government and NGOs that work to protect orangutans and rehabilitate confiscated orphans should be increased. 7. Bold and innovative approaches are needed to educate the public with regard to buying, selling, and keeping protected wildlife as pets. Victor Nijman. 2005a. Hanging in the Balance: An Assessment of Trade in Orang-utans and Gibbons on Kalimantan, Indonesia. A TRAFFIC Southeast Asia report. Victor Nijman. 2009. An Assessment of Trade in Gibbons and Orang-utans in Sumatra, Indonesia. A TRAFFIC Southeast Asia report. Victor Nijman. June 2005b. In Full Swing: An Assessment of Trade in Orangutans and Gibbons on Java and Bali. A TRAFFIC Southeast Asia report. Serge A. Wich et al. 2008. Distribution and conservation status of the orang-utan (Pongospp.) on Borneo and Sumatra: how many remain? Fauna and Flora International. Oryx42(3):329-339. Eric Meijaard et al. August 11, 2010. Hunting a key factor in Orangutan’s decline. TRAFFIC home page.